Home Page . Resources . Tambourine Studio is a one-room recording environment in Venice Beach, California specifically set up for recording percussion. Its a no-frills, bright, live-sounding space of about 1000 sq. with average 15 ceilings. Set in an industrial loft-style room with natural light, all the controls are on the floor with the mikes and the instruments. All the computers and recording machines are isolated- there's no machine racket or fan noise in the mike path. The recording package includes 16 tracks of Tascam DA-88 with 1/2" Video Lock , Apogee D/A converters with resolutions up to 96K at 24bit, Millennia and Apogee Mic Pre-amps , Neumann TLM 170I's, AKG 414EB and Schure mics. 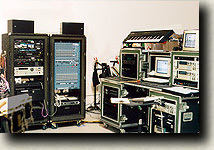 Mac computers running MOTU Digital Performer, Emagic Logic Audio interfaced with MOTU 2408 system, and basic Pro-Tools via Audiomedia III. Resident instruments include Steve Formans Electronic Percussion System including Kat MIDI controllers, Samplers from Emu, Roland, Akai and a complete proprietary library of percussion and FX samples; signal processors from Lexicon, Korg, and Roland, a Speck SSM Mixer, KRK and NS10 monitors. The resident acoustic percussion collection encompasses all the standard orchestral percussion instruments including four Walter Light Dresden-style timpani, Musser vibes, glock, and marimba plus a vast collection of ethnic drums, folk instruments, sound sculptures and unique "found objects" including an awesome 6 X 10 suspended stainless steel sheet. All equipment in the Instrument List is included in the studio fee and always available. There's no additional rental or cartage expense. Tambourine Studio provides the musical experience, equipment and multiple production skills of LA studio veteran Steve Forman in the most comfortable and cost-effective process possible. Composers can work one-on-one with a percussionist who understands film scoring and the composer's creative agenda. But clients are encouraged to hire any qualified percussionist they prefer and still take full advantage of the resident instrument collection. 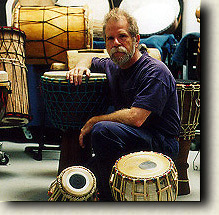 Click or scroll down to get a better idea how it works using Steve Forman and Tambourine Percussion Studio. Tambourine Percussion Studio directly addresses the requirements of composers packaging projects. We provide professional performances, top quality instruments and clean recording quality at a manageable cost. 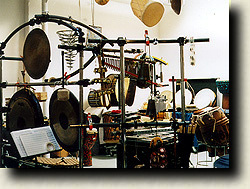 Tambourine Studio also allows a composer involved in a major production to focus on special percussion concerns in a relaxed low-profile environment, without an eighty piece orchestra standing around on the clock. We offer an opportunity to experiment and develop concepts, using real sounds and textures early in the demo phase of a score. You can prepare crucial segments of the project carefully for presentation. The daily studio fee is less than a typical percussion cartage bill in LA. This represents a significant value as compared to the costs incurred recording a percussionist in a full-service audio facility. Consider the minimum hourly rates for a high-overhead sound stage, the video lock gear, an engineer, and a cartage bill for the instruments plus rental fees for any electronic percussion. Factor in the pressures of time constraints associated with traditional recording sessions and it's easy to see why composers who package projects often forsake live percussion performances. At Tambourine Studio we understand how packagers really work; we 're package projects ourselves. Contact us for specific rate quotes and we'll help you put real performances on your project. Musician's performances are not included in the studio fee. Typically a composer (and an optional engineer or assistant) will show up in the morning with a work in progress with a reference mix of some kind on at least one track and SMPTE, video with timecode when relevant, and bar charts with a few specific ideas or key hits indicated-- or a floppy with standard Midi files so we can print a quick parts as needed. Most clients bring their own hard drive with a clone of whatever sofware file the've been working on and simply add new tracks for percussion. This is an efficient way to work on a low-budget film or TV movie when percussion is a late or last layer in the tracking process. 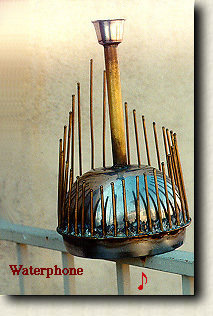 In another common situation percussion is pre-recorded at Tambourine with the idea of recording a live orchestra later. This is great way to multi-track a deep groove or ethnic texture and integrate it into the orchestration without getting that "Flintstones Bongo Effect" resulting from forty open mikes on a big sound stage. All the usual orchestral stuff like timps, gran casa, gongs, piatti and mallets are still recorded with the orchestra; they sound fabulous on a big live stage. But the driving rhythmic and third-world sounds stay under control and equally important so do the ethnic styles and concepts. On something like this Steve would probably work on his own-- at least until the tracks are built up enough to present. Obviously there are more complex sync issues and schedule concerns, but this works well for the appropriate project. Quite often, particularly for a score largely done on synths, a writer just sends a video reel, a sketch, and a d-88 tape or a file in his perfered format and Steve works alone applying a combination of acoustic and "virtual" sounds while the composer works elsewhere on another agenda. Then tapes are swapped messenger and the next set of cues get percussion overdubs (or pre-records) as the composer forges ahead. If your going to disc you can send files over the internet. Call us and we'll help you set it up. It's a good strategy for those projects with ridiculous deadlines. Whatever your work style, the job gets done without a lot of extra baggage encumbering the creative process. No cartage, no copyist, no rentals , no need for a production assistant at every step (althjough it sure helps). Musicians services are hired and billed consistent with standard practice AFM contract guidelines*. The applicable scale depends on the project and the service; there's actually a wide variety of AFofM agreements which might be appropriate. Call us and we'll help you find a way to put real percussion on your project, or better yet drop by and see how you can use Tambourine Studio to your advantage.